Is there any way to speed up iOS 10 on Older iPhone or iPad? Let’s check it out. iOS is the operating system of iDevices and recently on September 13 Apple Inc. has released the latest version of iOS that is iOS 10 and enables all supported devices to be installed with this software. I have given here the list of supported devices, and they are iPhone 5/5c/5s, iPhone 6/6 Plus/6s/6s Plus, iPad Air, iPad Air 2, iPad mini 2/3/4, iPod touch 6. All of these devices can update their OS to iOS S10 and can enjoy the new features provided by this software. But the iPhone user may face some problem after upgrading to the latest iOS version. People using older iPhone devices may encounter with the issues like battery drain, slow performance or sluggishness, etc. If you have just updated iOS and experiencing performance issues, then there are a few things you can do to help improve performance a bit. Today we will look into these 10 simple and different ways to speed up iOS 10 on older iPhone and iPad. If you have the latest iOS device like iPhone 6 or 7, then the iOS 10 update would not be a problem for you. This tutorial is for those, who has an older iPhone or iPad like iPhone 5 or iPad Mini 2. I have shared some quick tips and tricks to enhance iOS 10 performance on these old devices. If your device is running short on data storage, it’s time to clean up and take a look at which apps are taking up the most space. Low disk space makes your phone sluggish. It is good to keep some space free on your device so that your device will perform smoothly. You can delete photos, songs and videos after backing up them and also remove unwanted apps and documents which are of no more use to free up space on your iPhone or iPod, this is the easiest way to speed up your old iPhone. To see how much free space you have, go to Settings> General > About. This will show you the free space and space used by the apps and data. Delete the unwanted data from your device to improve the performance of your iPhone. Or, you could follow the simple trick to increase storage on iPhone or iPad. Automatic downloads are convenient as this will allow the apps to update itself automatically in the background without taking the permission of the device’s owner. But this may not be right for you because automatic downloads can strain both your battery and your data which will also affect the performance of your CPU. You can disable this feature and if you need to update your apps you can do it manually via the App Store app. To turn off the automatic download option on the iOS device go to Settings > iTunes & App Store and tap the switch to turn off the updates. In iPhone devices, apps continue to refresh themselves in the background which leads to putting a strain on your iPhone’s battery and also affects the CPU performance. To increase the speed of you iPhone you will need to disable Background App Refresh. To do so navigate to Settings> General, in the General section, find and tap on “Background App Refresh”. You will be presented with a list of all currently installed apps which support Background App Refresh. Disable the Background App Refresh entirely by tapping the green toggle switch at the top of the list. The Location services feature in the iOS device to keep track of your location throughout the day, whether in the background or the foreground, in order to deliver you different kinds of features like GPS and Maps, weather information, find a nearby restaurant, etc. But an enabled Location services application eats more battery than disabled location services iOS apps. So to save your iPhone battery it is better to keep turn off location services. So to do this go to Settings> Privacy> Location Services, here you can view a list of apps that have access to your location information and a toggle switch to turn off Location services entirely to speed up iOS 10 on older iPhone and iPad. Apple devices come with a number of effects like parallax effect that makes the home screen icons float when moving the phone around. It means that when you tilt your phone, the wallpaper moves with it. It is also responsible for draining battery life fastly. To turn it off go to Settings >General > Accessibility and move the slider on Reduce Motion to ‘ON’. This will disable the nonessential screen transition effects and hence speed up your iPhone. By default, Apple’s iOS applies a transparency effect to the control center, Notification Center and Spotlight search menus which blurring the background for effect. It adds some fun effects to your device which most of the people may like it, but in some cases, it can cause the readability issues and also use more processor power which leads to slow down the performance speed of your device. To turn on Reduce Transparency go to Settings > General > Accessibility > Increase Contrast and enable the “Reduce Transparency” switch to speed up old iPad and iPhone. It is the best option to speed up your device performance. It will reset everything and delete all data of your device and return your phone to the default condition. So, you must back up your applications, videos, music, pictures, etc. before performing a reset. To fully reset your iPhone, go to Settings > General > Reset and tap on “Erase All Content and Settings” then enter the password and confirm to delete all media and data. This will definitely speed up iOS 10 on older devices. Sometimes a hard restart will fix performance woes and speed up the OS. If your device keeps running for a long time without a fully power off, many temporary processes of apps could eat your device’s CPU and result in a bad and slow performance. To restart, hold both Sleep and Home buttons simultaneously for at least 10 seconds until the Apple logo appears. That will reboot the device and will undoubtedly improve iOS 10 performance. Web browser cookies, caches, and other data are also responsible for a slow iPhone performance. All of us visit a number of websites every day on the device, if we don’t clear history and website data from the iPhone from time to time, then it will result into sluggishness of your device. You can clear the browsing history from the setting; this is an effective way to speed up iPhone. Some apps may go slowly on your iOS devices if they are not compatible with the new iOS 10 operating system, this also results in poor performance of iPhone. So it is always a good idea to update your device apps to their latest versions. These are the ways to speed up iOS 10 on older iPhone or iPad. 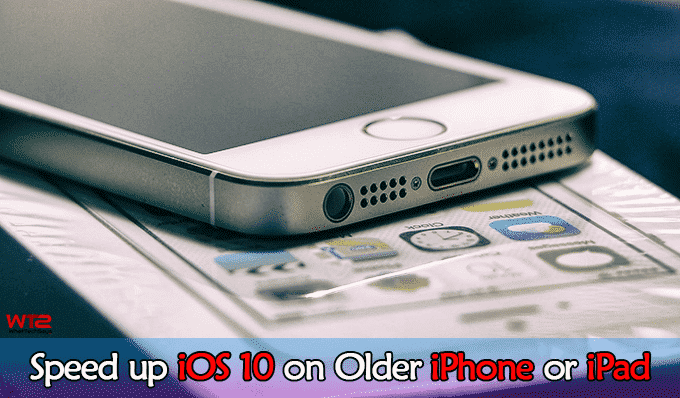 If you have an older device running on iOS 10 and you are facing performance issue, then you should definitely try these tips and tricks to increase iPhone or iPad performance.